I am extremely excited about this salad! It was just SO delicious...thanks a bunch to Ashlee at ABpetite for sharing this one! Without a doubt, I'll be adding some of her recipes into the weekly rotations...can't wait to try more. CLICK HERE to check out her original post. The only thing I did differently was add some sliced black olives, grape tomatoes, and topped it with some homemade croutons. YUM!!! Place parmesan in one small bowl and the egg whites in another small bowl. Dip chicken breasts first in eggs then in cheese. Put chicken on cookie sheet (sprayed with non stick cooking spray) in oven preheated to 350 degrees for 30-35 minutes until chicken is no longer pink inside. Let chicken cool for about 5 minutes. Cut bread into small cubes, put on cookie sheet, bake until nice and toasty. 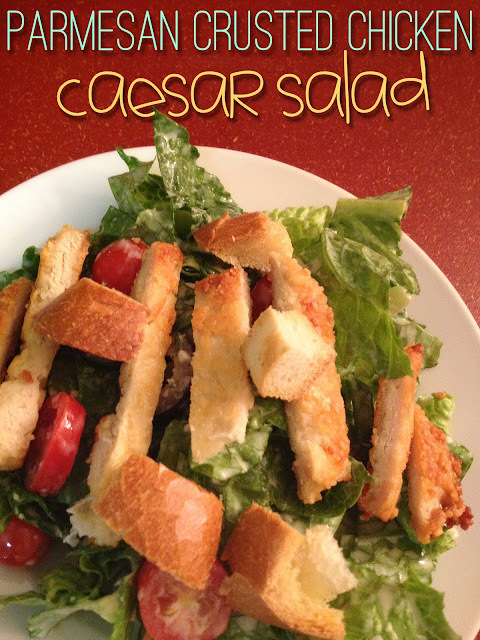 In a large bowl, add romaine lettuce, sliced olives, and tomatoes, croutons, slice the chicken and add on top. For the dressing, just mix all ingredients together - super simple! Ashlee recommends topping it all off with some fresh ground pepper. sounds super yummy! happy monday friend! Yummy yum yum! Looks fantastic I LOVE all the adds cutie!! Thanks for following...loving yours as well! Thanks for stopping on by my blog! LOVE yours and I cannot wait to get to know you better and whip some of your deliciousness up for my hubby. Thanks for sharing! I know...genius! Wondering how I never thought of that before! It's The Most Wonderful Time... For A GIVEAWAY!! !